ridiculous! noted, signed and shared. Good grief, they look like cotton balls! They'd be really cute if they were, but knowing they're alive makes it sickening. signed. Hopefully before too many get colored. Signed, paint on paper people. Humans who want to do this have reached a whole new level of stupidity! And once the 'new' wears off? More abandoned, "discarded" live animals - how very sad! Just another money-making 'racket' due to human want and greed!! You want to dye something dye yourself!! Signed! Major idiotism going on here! It's those idiots who should be dyed in all colors of the rainbow and not the pets. Signedf in private email yesterday, noted and posted to FB. This is beyond the words. Animals are real nature beauties! What a stupid thing to do. Signed and noted. Purchased by idiot parents to give to children who are far too young to begin to care for their new pets, the vast majority of chicks and rabbits sold during the Easter holiday season DIE within weeks of purchase. 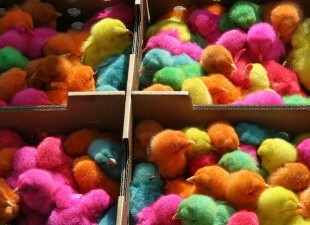 Ban dyeing pets...we need to go much further than that...we need to ban selling chicks and rabbits during Easter. The fact is neither is really that good of a pet especially for small children. Anyone that really wants to save any of these doomed animals needs to organize and work towards a moratorium of these creatures during Easter. corr: "...work towards a moratorium of SELLING these creatures during Easter."